Chhatarpur Mandir is truly a wonder of architecture, where stones appear to transmit poetry. 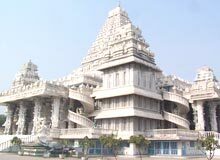 Chhatarpur Temple is located on Gurgaon-Mehrauli Road, in South Delhi. The temple is easily accessible by buses, autos, metro and taxis from the city. This marvelous temple is accredited for being the second largest temple of India. In fact, it was the largest temple (India) before the creation of Akshardham Temple (Delhi) in 2005.